For Crisis response operations, Air Command and Control operational structures are set on the basis of a Joint Force Air Component (JFAC). The command and control of air assets is one of the most integrated, adaptable, flexible, responsive and high tempo military processes in existence. Air Power’s characteristics place great importance on the accurate coordination and synchronisation of the Air Plan. Equally, the tremendous demand for air assets, from all components requires Air Command and Control to allocate tasks and missions in a highly responsive and flexible manner. HQ Allied Air Command is responsible to stand up the NATO Command Structure JFAC for any NATO operation. To achieve this, a permanent full-time "Core" team of approximately 30 personnel are tasked with developing and articulating JFAC policies in a manner coherent with the Commander NATO Allied Air Command's intent. 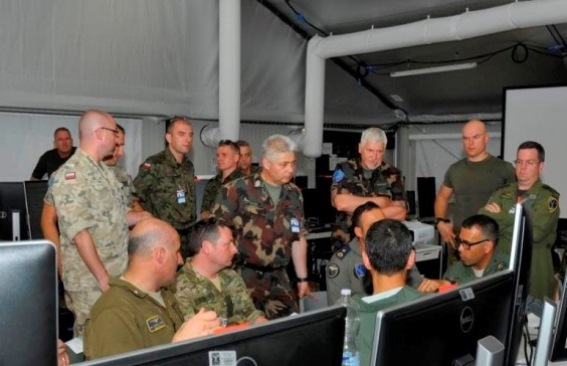 They provide a wide variety of Subject Matter Experts from the full spectrum of NATO military and civilian specialist areas who may be routinely called-upon to furnish advice to the Core JFAC. Depending on the size of the operation, the JFAC may be specially tailored to meet the mission requirements; it can be supplemented from all Allied Air Command entities or augmented from other NATO Force Structure (NFS) or national JFACs as required for NATO missions. Few Nations can provide their own National JFACs as part of the NATO level of ambition. As of today, France, Germany, Italy, Spain, Turkey, the United Kingdom and the United States of America have JFAC capability.